This little excursion is into who is talking to whom when it comes to climate science and the broader world. It is presented simply as crosstabs of 4 variables from the survey of climate scientist. Considerable discrepancies between count and expected values (where count is higher) are shaded in yellow. 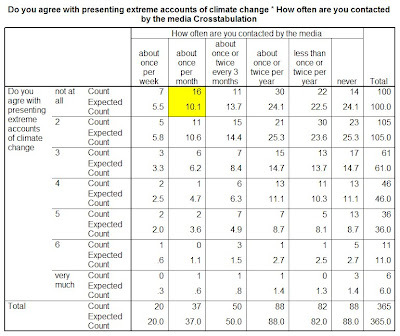 Table 1 looks at the results of: How often are you contacted by the media for information pertaining to climate change? * How often are you contacted by policy makers for information pertaining to climate change? There seems to be an inordinate number (higher actual frequency than expected value) of scientists who speak to the media on a weekly and monthly basis and an inordinate number of scientists who never speak to either the media or policy decision makers. This in itself doesn’t tell us too much. However, there seems to be a tendency for a concentrated number of scientists doing the talking for the scientific community. Interest is, or should be, more in the content of the message. This is briefly addressed in the remainder of the discussion. Table 2 looks at the results of Over the issue of climate change, the general public should be told to be unconcerned/very worried. * How often are you contacted by the media. Here there seems to be no major discrepancies between count and expected count. So it would seem the media receives well diversified opinions, regardless of what finds it way into public presentation, suggesting perhaps it is the media, perhaps media with a mission, that is guilty of presenting any swayed account, not necessarily the scientist, at least not the scientists in this data set. However, we should note that concerning the message to the public, the majority of the scientists in the sample tend towards a perspective that the public should be informed of at least some level of concern (values 5 - 7). Here there also seems to be no major discrepancies between frequencies and expected counts. 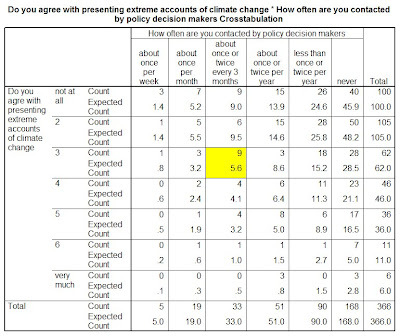 A quick look seems to suggest that climate scientists in general think the public should be somewhat concerned. So it would seem policy decision makers receive well diversified opinions, swayed towards the possibility of an endangered public, regardless of what finds it way into policy suggestions. Table 4 looks at Some scientists present extreme accounts of catastrophic impacts related to climate change in a popular format with the claim that it is their task to alert the public. How much do you agree with this practice? * How often are you contacted by the media. 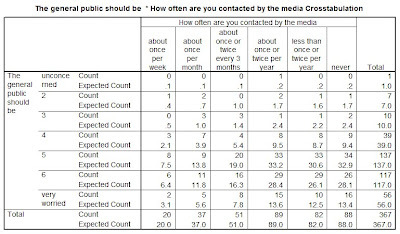 With one exception, scientists claiming to be contacted by the media about once a month and who do not agree at all that the public should be concerned (count = 16, expected count = 10.1) all frequencies and expected values show little discrepancy. What can we say about this: Well, perhaps the anti-alarmists are contacted a little more often (by representation) as there might not be as many to approach or as many willing to comment. Again, there seem to be no major discrepancies between frequencies and expected counts. It would seem the media and policy decision makers get a diversified set of opinions. What they pay heed to is beyond the control of science. However, it also seems that comparing Table 4 and Table 5 there is one major discrepancy. If we look at the column (typically the independent variable) for ‘never’ in terms of contact with media and policy decisions, we find that comparing the actual count between the two tables demonstrates a rather large difference. 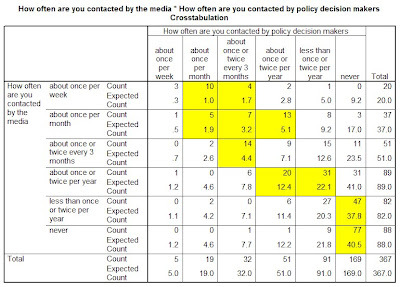 For example ‘How often are you contacted by the media - never-* do you agree with presenting the extremes - not at all’ compared to How often are you contacted by policy decision makers - never * do you agree with presenting the extremes - not at all’ we find actual frequencies of 14 and 40 respectively. Does this mean scientists are more likely to talk to the media about extremes than they are to policy decision makers? Being contacted is entirely different then being QUOTED. It's completely different. And it's not like there isn't some gatekeeping going on by the media and policy makers. If it were so balanced, then why are so many people turning to the internet for their information? Do you know how often I've heard in the German media terms like "Klimakiller", "Klimakatastrophe", etc.? About a million times each. So perhaps we can conclude from your study that the media are trying to sway public opinion. May be self-selection. Journalists like to talk to extremists, while decision makers prefer the more respectable middle-of-the-road types. There is a useful typology developed by Goodell (1987) who draws a pyramid model of the visibility of scientists. No 1/2 - Obviously you are upset about something - something I likely do not read from the little analysis. Courtesy demands that you think about how to make your point, before posting it. Try to explain in polite words what you mean - do not just ramble. I'm just saying that I believe there is a big disconnect between what scientists are telling the media, and what the media is actually telling their audeince. Only making an observation. The 2007 Word of the Year in Germany I mentioned is some evidence I offered. In 2007 I do not recall hearing all German climate scientists ringing the alarms of catatrophe in concert, yet one could surmise they were - just by llistening to the media. "Ausgewählt werden solche Wörter und Phrasen, die die öffentliche Diskussion des betreffenden Jahres besonders bestimmt haben, die für wichtige Themen stehen oder sonst als charakteristisch erscheinen." I would suggest that comments should relate to the issue offered for discussion in the different post. The analysis provides no data on what is provided to the media, and what eventually is published. An interesting issue, certainly, but there should be a basis for a discussion. If you want to discuss a different issue, then submit a guest article on that issue, explaining you hypothesis, and presenting your evidence. Being contacted is, I agree, entirely different from being quoted. But someone who does not allow his or her self to be quoted would not likely be contacted very often. What is the point of the media contacting someone if the media is prohibited from quoting a source. At least for science issues. Seems to me there might still be some hesitation. In your estimate of hearing 'Killerklima' and Klimakatastrophe' about 1 million times, the issue is, how many people were making the quotes, not how many times the quote was repeated. I think the media are trying to sell their products. 'Catastrophe' most likely sells better than 'nothing happened'. I think this is an accurate assessment. Of course, there are those of political inclination - Al Gore for example - who would use extremist opinions for his own ends. 'On the top are those scientists who are motivated, who can be quoted, who are colorful, credible and accessible to become celebs' I can think of a number of examples that meet all of the above criterea with the exception of 'credible'. In fact, it is the incredible that seems to propel them to the top. I am not familiar with the work of Goodell but he seems either not to be familiar with climate science or not to be familiar with the concept of mutual exclusivity. Having not read his work, however, I must offer that this statement might be a little premature. As a minor point of criticism - seems to me the categorization of "extreme accounts" might not be the best way of measuring this variable and may undervalue the responses. I would guess many respondents who do have such "extreme" views would not consider them extreme at all - merely realistic. "Extreme" can suggest exaggerated, thus even respondents warning of catastrophic consequences may have a low level of agreement with the question. But thanks for carrying out this survey - it will be helpful for my own work.